Every two minutes, one case of breast cancer is diagnosed in a woman in the U.S. Currently there are more than 3 million breast cancer survivors in the U.S.
New York is one of the states with the highest breast cancer incidence rates. 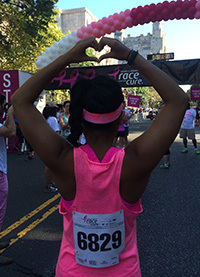 Every year, about 15,000 New Yorkers are diagnosed with breast cancer, and 2,700 die from the disease. Except for skin cancers, breast cancer is the most common cancer among women in the U.S. accounting for 29 percent of newly diagnosed cancers in the U.S.
Every 13 minutes, one woman in the U.S. will lose her life to breast cancer. Early detection and effective treatment resulted in a 36 percent decline in breast cancer mortality (deaths) in the U.S. between 1989-2012. Worldwide, breast cancer is the most frequently diagnosed cancer and the leading cause of cancer death in women. Overall, breast cancer incidence is about the same for African-American and white women. However, for women younger than 45, incidence is higher among African-American women than white women. Breast cancer is the most common cancer among Hispanic, Asian-American, Native Hawaiian and Pacific Islander women in the U.S. The median age at the time of breast cancer diagnosis in all women in the U.S. is 62. In 2012 (most recent data available), breast cancer death rates were 42 percent higher in black women than in white women. Breast cancer is the leading cause of cancer death among Hispanic women in the U.S. Breast cancer is the second leading cause of cancer death among Asian-American, Native Hawaiian and Pacific Islander women.